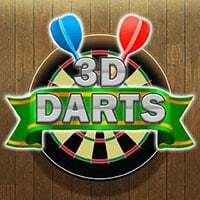 Play this exciting 3D darts simulator and try to beat the computer or a friend on the same device! Choose between a 101, 301 and 501 game and select a difficulty that matches your abilities. Throw 3 darts, take turns and be the first to reduce your score to exactly zero to win. Game modes: Cricket, 501 (double out), 301 (double in & out). Can you become a real darts sports champion? Enjoy the game and throw some darts! This game is one of the sports games on Round Games. Enjoy and have fun. 3D Darts is a free online sports game on Round Games.